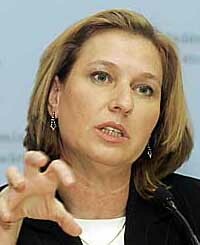 Tziporah Malkah "Tzipi" Livni, born 8 July 1958, is an Israeli lawyer and politician. She was the Israeli Opposition Leader from 2009 to 2012 and leader of Kadima, the largest party in the Knesset. Raised an ardent nationalist, Livni has become one of her nation's leading voices for the two-state solution. In Israel she has earned a reputation as an honest politician who sticks to her principles. She is the first woman to be leader of the opposition in Israel. In 2011 Livni was named one of "150 Women Who Shake the World" by Newsweek and The Daily Beast. Tzipi Livni served as a lieutenant in the Israel Defense Forces (IDF). According to an interview in Yediot Aharonot, described in The Sunday Times, she served in the elite Mossad unit responsible for Operation Wrath of God (also known as Bayonet) in the 1980s. She resigned from the IDF in August 1983 to marry and finish her law studies. In December 2009, a warrant for Livni's arrest was understood to have been issued by a London court at the weekend, following an application by lawyers acting for some of the Palestinian victims of Operation Cast Lead, focused on Livni's role in Israel's war against Hamas-run Gaza at the turn of the year. It was withdrawn after she cancelled her visit. For several years, Palestinian activists have made largely unsuccessful attempts to prosecute Israeli officials in European courts under the universal jurisdiction system. The warrant was issued on 12 December and revoked on 14 December 2009, after it was revealed that Livni had not entered British territory. Israeli government experts on international law have advised cabinet ministers with a security background and senior IDF officers not to visit Britain, Spain, Belgium or Norway, because in these countries they risk being arrested on charges of alleged war crimes through “universal jurisdiction” laws. The warrant was later denounced as "cynical" by the Israeli foreign ministry. Former Israeli Foreign Minister Tzipi Livni said on Tuesday that the use of force against the Gaza Strip “does not bring tranquillity,” Al-Resalah has reported. Livni made her comments on Israel's Wallah news website. “We need a diplomatic line that leads to disarming the Gaza Strip,” she explained. In January, Faisal met with former Israeli Foreign Minister Tzipi Livni on the sidelines of the World Economic Forum in Davos, Switzerland. Tzipi Livni, Isaac Molho, and Saeb Erekat meeting in Jerusalem. Tzipi Livni, Isaac Molho, and Saeb Erekat meeting in Jerusalem in August. He had suggested raising the threshold from 2% to 6%, but compromised because of opposition by the then-justice minister, Tzipi Livni. ... for America's UNESCO decision; the party's Tzipi Livni joined in, and together they proved that these days there's no opposition in Israel. February 10, 2009 - After an election, the results remain unclear as to who will become prime minister, Netanyahu or chief rival Tzipi Livni.